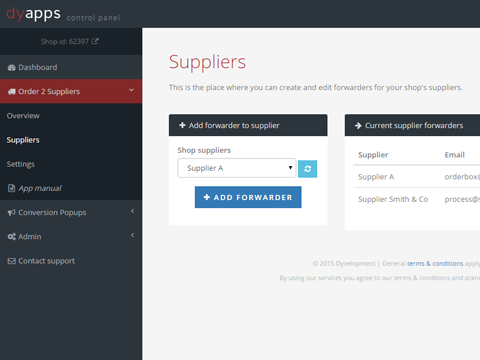 With the Orders 2 Supplier app from Dyvelopment you can easily forward your paid orders to your suppliers by mail. This is ideal if you are for example a drop shipper or for any other reason you want to forward your orders to your supplier(s). You even have the possibility to set up your own email template and only forward orders when the products hit a certain stock level threshold. In your shop you connect your products to a ceertain supplier. 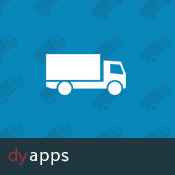 After installing the app you'll be redirected to our Apps Control Panel where you can add a forwarder to your shop's supplier. 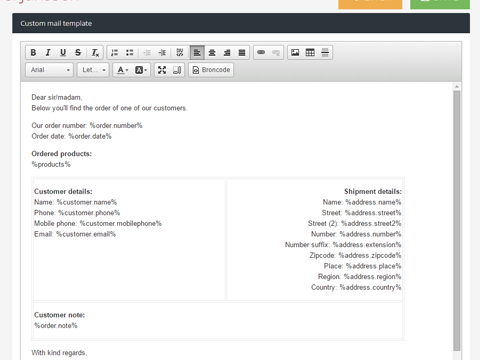 You will only have to enter the email address for you supplier, optionally you can edit the mail template or set up a stock level threshold. The app will do the rest for you: paid orders will be forwarderd to the corresponding supplier. 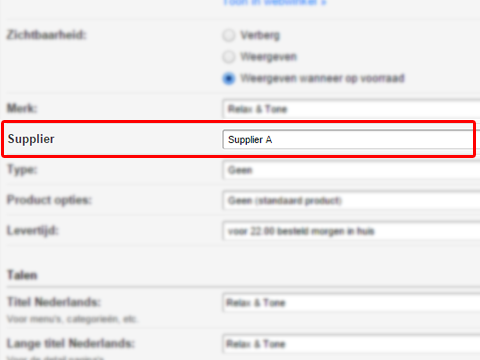 Of course the app recognizes the products that belong to the supplier, and only sends those products to the supplier. Do you want to stop forwarding the orders to a certain supplier? Just remove the fowarder in the Apps Control Panel. We're a company that builds and designs beautiful websites and webshops. We're also true Lightspeed experts in case of technical or design solutions. Need a custom solution or extra functionality for your Lightspeed? Please contact us via our website http://www.dyvelopment.nl. Check the documentation for details on how to use this app. For quesstions you can also contact us by mail. We'll try to respond (also in the evening!) as soon as possible.